Yulia Volodymyrivna Tymoshenko (Ukrainian: Юлія Володимирівна Тимошенко, born 27 November 1960), is a Ukrainian politician. She is the leader of the Yulia Tymoshenko Bloc political party, and former Prime Minister of Ukraine. She has served two terms. Her first term was from 24 January to 8 September 2005. She was re-elected on 18 December 2007 but was ousted by the Ukrainian Parliament on 3 March 2010 after the government with her own political party and the political party of Viktor Yushchenko (former President of Ukraine) Our Ukraine and the small Lytvyn Bloc lost a no-confidence vote. While they were once strong allies, today there is a lot of political rivalry between Yushchenko and Tymoshenko. When Viktor Yushchenko lost the 2004 Ukrainian presidential election, and his followers argued that the election had been corrupt, she was his main ally and one of the leaders of the Orange Revolution. In February 2010 Tymoshenko lost the presidential election to Viktor Yanukovych; with a 3.48% difference, she said Yanukovych won because of fraud. She has promised to make life for the new President as difficult as possible. On 11 October 2011 a Ukrainian judge sentenced Tymoshenko to seven years in prison for misusing her powers as Prime Minister when she signed a natural gas deal with Russia in 2009. She had been in prison for improper behaviour in court since 5 August 2011. 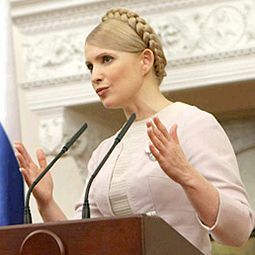 Tymoshenko appealed against the sentence on 24 October 2011; she said the sentence was an act of revenge by Viktor Yanukovych (he has said it is not). The European Union and Russia protested against the sentence. Tymoshenko's first name is sometimes spelled Yuliya, Yulia, Iulia, or Julia. Wikimedia Commons has media related to Yulia Tymoshenko. This page was last changed on 20 June 2018, at 01:19.